It’s always a good time to read it if you haven’t already. The book should be the first book on innovation because it helps you establish the proper attitude toward the concept of innovation. And the book should always be on your bookshelf because it’s the perfect reminder that keeps you from the traps and misconceptions of whatever books, seminars, innovation experts, consultants tell you about innovation. Innovation is not something you can buy like buying the services of an ad agnecy; it’s also not something you can create or build like creating a plan or building a house. Arguably, innovation can’t even be managed (in its traditional sense as “management” in business). Innovation can only be articulated, facilitated, and afforded. Because innovation is the result of a certain kind of culture, along with the effort of many open minds. Innovation is the by-product of creative exploration. It can be analyzed. But it’s also an art. 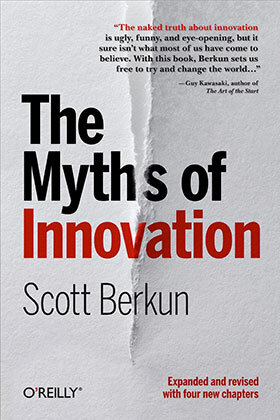 The Myths of Innovation clears up all the clouds around the hype. And in the end, the love you take is equal to the love you make. Only open minds, open cultures, and hard work can bring about something we call innovation.